Welcome once again to the most frightening thing you will encounter all week. And it's not a naked man chasing you with a water balloon. It's Frightening Friday! Once again, I will tell you a terrifying tale, and you will get really scared. And while I would love to reassure you that you won't die from fright, I can make no guarantees. So if you die after you read this story of horror, your relatives cannot sue me for everything in my bank account--which I can assure them right now is not much. Witches lived quite happily in the town of Salem for many, many years. And while they had warts and large, pointed noses and wore long, black dresses and tall, conical hats, the warts were actually very becoming with their features and they were always sure to wear pink and purple striped socks with their outfits for a bit of color. Unfortunately, going by names like Warthazel and Broomhilda made them stand out terribly among the Salemites, who typically had more traditional names, like Mary and Cotton. 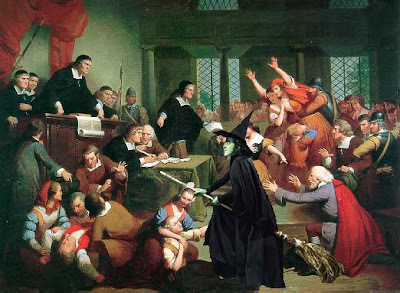 So, while the witches just really wanted to live peaceful lives and go about their days of brewing potions and racing through the night on their brooms, the people of Salem had to go and be all annoying and oppressive about it. You see, the people of Salem were ridiculous and extremely religious and had no senses of humor at all. Not even when Goodwife Brewster thought it would be funny to put farting powder in Samuel Putnam's evening tea, and especially not that time John Hubbard wrote "Kick me" on the backside of William Hawthorne's trousers and stood back and watched in amusement as everyone in town did as he asked. So, while Warthazel and Broomhilda were just going about their business one night of mashing scorpions for a potion that would give everyone in Salem candy, the people of Salem decided to come to their hut with pitchforks and torches and set the witches on fire in a way that would guarantee them no candy ever again because that is just plain rude. "Come out, witches! And submit thine selves for a roast on the stake," said Goodman Polpot. "We are not at home," said Broomhilda, throwing her voice in a quite unconvincing manner. "Yes, you are," said Goodwife Mussolini-Brown, unconvinced by the unconvincing voice. "Okay," said Warthazel, and the two witches went outside to face their punishment for doing nothing at all. "Ye stand accused of being witches," said Reverend Adolf Green. "How do ye plead?" "Uh...guilty," said Broomhilda. "We told you we were witches when you 'colonized' this place." "Yeah," said Warthazel. "How is this suddenly a problem? Didn't you guys like last year's crop of gumdrops?" "No!" said Goody Mussolini-Brown. "We hated them! All of us preferred the licorice from the year before." "Exactly!" said Reverend Green. "Now you both must get burned at the stake because we are displeased by this year's candy bounty." As you can imagine, the witches found this entire process to be really stupid and annoying. So, they flew away on their brooms, as witches are wont to do. They eventually settled elsewhere and lived happily ever after. Later, local Indians, tired of the stupid tactics of the stupid colonists, very politely asked them to leave. The colonists agreed after many hugs and smiles. And the colonists sailed back to England where they would live to this day if they weren't all dead. Everyone was quite happy, and the Indians had all the candy they ever wanted. I always hated Candy Corn as a Halloween treat. @JPC: Candy corn is the worst. Don't even get me started. Did you read the post I did about giving it to people I hate? It's pretty good. When I came up to see you, Ray and I took a side trip to Salem. I wanted to see the Witch Trials museum. It was quaint, and just as funny as your blog. I recommend it. The town itself looks like the Addams Family are the housing authority. I will go there someday. I am naming my hypothetical child Cotton. And my other hypothetical child Polly Esther. As well as hiding my pointy witch hat from the neighbors. @lalaland13: You just want to be able to say, "He's the fabric of our lives" on his birth announcements. No I didn't see the Candy corn post, where can I find it? Happy Friday by the way. Cheers all! Aw, I like candy corn! I guess I'm the only one. Also, the name Cotton always reminds me of Cotton Weary from Scream. He sounds like a guy in search of a good poly blend, no? @Jen: No, there are tons of candy corn enthusiasts out there. If you don't believe me, go to Twitter/Facebook and make a comment about how much you hate it. People come out of the woodwork to defend its honor. Hahaha...I forgot about that Cotton. So there at least two in history, and one of them is fictional.